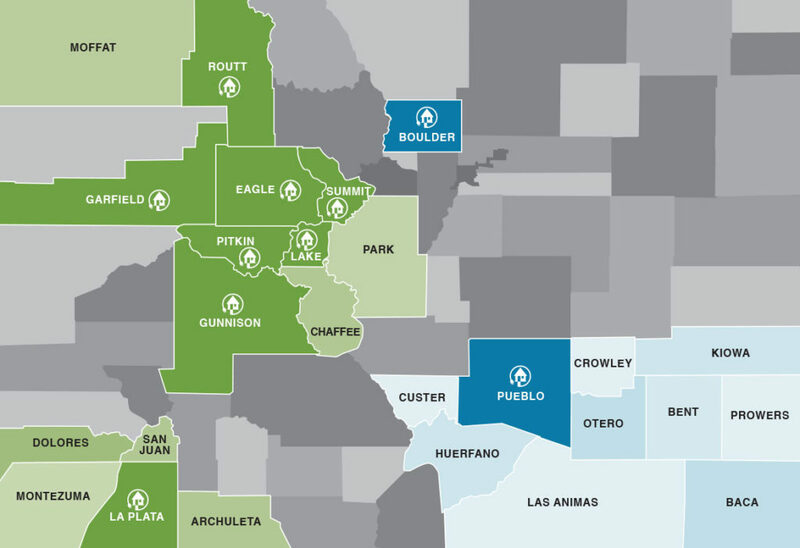 Click on the map to find the Energy Smart Colorado partner nearest you. Energy Smart Colorado (ESC) began in 2010 as a federally funded program to provide energy efficiency services to residences in the central mountain region. The program was created and delivered by Eagle County, Pitkin County, and Gunnison County working collaboratively with their community-based non-profit partners. Energy Smart Colorado is now a collaboration of 10 community partners serving 25 Colorado counties whose collective goal is to make residential and commercial energy efficiency improvements simple and affordable while advancing community-based goals for energy efficiency or climate action. Through ESC’s community partners, homeowners and businesses are provided with energy assessments, coaching on energy recommendations, access to financing (including rebates and loans), and connections to local contractors. In addition to starting up and supporting member organizations, Energy Smart Colorado also provides services to utilities and municipalities to help meet statewide and community goals for efficiency and climate action. These services include a consistent field assessment tool, a robust data management system, public education and outreach, participant enrollment support, and reduction tracking and data management. Energy Smart Colorado is helping communities and organizations advance community-based goals for efficiency or climate action by sharing resources, building capacity, and providing mutual support. Each home and business has its own unique energy needs. That’s why we have Energy Coaches and Energy Assessment tools available to help homeowners and business owners develop plans to improve the energy efficiency, comfort, health and safety of their building. Don’t let the cost of energy efficiency upgrades be a barrier to making the Energy Smart choice. Some energy efficiency measures require little funding, for improvements with a higher cost, we have cash-back rebates and loans.